We invite you to join us for Worship and learn more about us. Gathered in 1623, we are the oldest Congregational Church still in existence in the country. Our Worship Services are Sunday at 10am and all are invited. After the Worship Service we gather for fellowship, coffee, and light refreshments in our church hall. Come join us! Each Sunday morning we gather to worship as a congregation. You will find our sanctuary to be bright and inviting, offering the charm and intimacy that befits a New England church that has been in existence for almost 400 years! 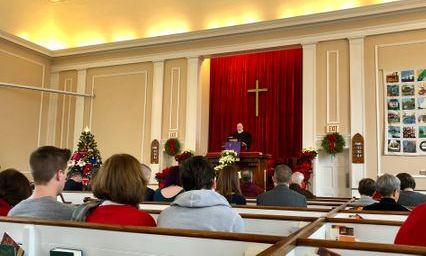 Our Worship Services truly reflect our Congregational Church tradition. Our Pastor leads a service in which Holy Scripture is revered, honored, and central to our Worship. We also celebrate Communion, the Lord's Supper, on the 1st Sunday of the month, and all who seek Christ are welcome at the table. Baptisms are also occasionally part of the morning Worship Service. We pray as a congregation, together bringing our joys and concerns to the Lord. Our music is a mix of traditional and contemporary hymns, led by our Music Director/Organist and choir. On the 2nd & 3rd Sundays of the month we have a brief children's sermon, after which the children depart for a Sunday School lesson; on the 1st & 4th Sundays of the month children remain in the Worship Service with their families. We then listen to God's Word, the Bible, proclaimed and preached. We conclude with a time of coffee, light refreshments, and fellowship before we depart to bring the Light of Christ to a waiting world! We believe in God as the only living and true God, in Jesus Christ, as the Son of God and the Savior of the world, and in the Holy Spirit as the enlightener, sanctifier and guide of God's people. We believe also in the Holy Scriptures as a revelation from God; as such we embrace them, promising to make it our careful, conscientious, and persevering endeavor to regulate our conduct agreeably to their requirement. The object of this Church shall be to bind together followers of Jesus Christ for the purpose of sharing in the worship of God and in making God's will dominant in the lives of people, individually and collectively, especially as that will is set forth in the life, teachings, death and living presence of Jesus Christ. The church acknowledges Jesus Christ as its head and finds in the Holy Scriptures, interpreted by the Divine Spirit through reason, faith, and conscience, its guidance in matters of faith and discipline. The First Church in Weymouth is an independent Congregational Church in this historic tradition. We express our bonds with the wider community through our vibrant relationship with the Town of Weymouth, and our covenantal relationship with the Massachusetts Association of Congregational Christian Churches. As a Congregational Church, our governance is vested in the body of believers who compose it, under the leadership of Jesus Christ and the guidance of Holy Scripture. The highest human authority in our church is the congregation itself, and we gather regularly for two annual meetings (Autumn and Winter), and for special meetings when circumstances warrant, in order to conduct the business of our church. Apart from those meetings, three Boards see to the regular affairs of the church. The Diaconate has oversight over the spiritual affairs of the church, including all aspects of the Services of Worship. The Board of Trustees has charge of the financial affairs of the church and acts as its legal representative in business matters. The Church Council is a mixture of elected, appointed, and ex officio positions; it is the church's Executive Board and handles the remaining affairs of the church between meetings of the Congregation. The church also has four standing committees (Christian Education, Mission and Outreach, Finance, and Publicity) which handle the day to day operations of many programs and aspects of church life. There are also elected officers who oversee and direct different aspects of church life and governance. Through the efforts of all these people and groups, the church is governed fully by its members. All are encouraged to become members and actively participate in the life and operation of their church! You can view the bylaws of The First Church in Weymouth here.